A child with intellectual disability finds it more difficult to learn, understand and do things compared to other children of the same age. However, the degree of disability can vary greatly. It is important to recognise, as soon as possible, that a child is learning and developing slowly. It is only when the problem is recognised that the child and their family can be offered the help and support they need. Intellectual disability does not stop a child from having a full and enjoyable life. The aim of all the specialist services is to help children with intellectual disability to have lives that are as enjoyable and fulfilling as those of other people. 1. What is meant by intellectual disability? 2. What causes intellectual disability? 5. What can be done to help? 1. What is meant by intellectual disability? Intellectual disability used to be known as mental handicap, mental retardation or learning disability. 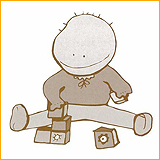 Other terms sometimes used are general or global developmental delay. A child with intellectual disability finds it more difficult to learn, understand and do things compared to other children of the same age. Like all children and young people, children with intellectual disabilities continue to progress and learn throughout their childhood - but more slowly. Causes include genetic factors, infection before birth, brain injury or damage at birth, brain infections or brain damage after birth. Examples include Down's syndrome, Fragile X syndrome and cerebral palsy. However, in many children with intellectual disability, the cause of the disability remains unknown. Children or young people who have an intellectual disability are aware of what goes on around them. However, their ability to understand and communicate may be limited, and they can find it hard to express themselves. Speech problems can make it even harder to make other people understand their feelings and needs. They may become frustrated and upset by their own limitations. When they compare themselves to other children, they may feel sad or angry and think badly of themselves. For a parent, it can be distressing to find out that their child has an intellectual disability. It may be hard for them and other members of the family to understand why the child is like this. It can also be hard to communicate with the intellectual disabled child, difficult to manage their behaviour and hard for other people to understand. An intellectual disability is not a mental illness. However, children with intellectual disability are more likely to develop mental health problems, for example anxiety, or have additional developmental disorders, such as Autism Spectrum Disorders and Attention Deficit Hyperactivity Disorder (ADHD) than other children. It is important to recognise, as soon as possible, that a child is learning and developing slowly. It is only when the problem is recognised that the child and their family can be offered the help and support they need. The Maternal and Child Health Centre plays an important role in recognising slow development in the years before school. When parent, teacher or the Maternal and Child Health Centre recognise the child might have slow development, they can refer to the paediatricians, family doctors, educational psychologists, clinical psychologists, social workers, speech therapists, child assessment centres, child psychiatrists or other members of the child and adolescent mental health service (CAMHS). School can be a particular challenge for children with learning disabilities because of both the learning and social demands. Local education departments can make special arrangements in mainstream schools to meet the educational needs of each child. For example, children who are able to cope comfortably with other people are likely to attend an ordinary school, but have special forms of teaching. On the other hand, a child with a more severe disability may go to a special school. For some children, an educational psychologist will give an assessment and prepare a statement of special educational needs. This sets out what special help the child needs and takes into account the views and wishes of the child and their parents. While in need, school social workers, medical social workers, nurses or occupational therapists might arrange some short training courses and provide respite care to the children. There are non-governmental organisations provide emotional support service, parent support group and other relevant services for children with intellectual disability.